Jersey boys' fifth flirts outrageously with flamenco, Hi-NRG, dubstep and Oompah. No, not really. Brian Fallon may have inadvertently caused fans of the Gaslight Anthem a few sleepless nights recently. During the recording of Get Hurt, the quartet had seemingly decided to burn their bridges, throw their trademark sound of adrenalized, literate, punk 'n' soul-infused rock into the Raritan River ,and start over. It's an admirably gutsy move, considering the success of 2012's vibrant Handwritten which sold 40,000 out of the gate in the US, hitting number three before pole-vaulting the pond to début at number two in Ye Olde Blighty. Now the Modus Operandi for GA 2.0 was "TRY EVERYTHING!" This even included secret liaisons with the antithesis of all things held sacred in rock 'n' roll. Computers and synths! As the mixes were waxed and polished, Fallon warned fans to prepare for a "completely different vibe". Zoiks. Well Get Hurt isn't exactly the reinvention of the Ferris wheel it was purported to be. It doesn't sound like Einstürzende Neubauten, Aphex Twin or even "Iggy Azalea featuring Charli XCX" played through a Marshall amp. It sounds, mostly, as you would imagine the fifth Gaslight Anthem record to sound. Older. Wiser. Nicer shoes. Sure the speedballin' rhythm guitars are occasionally muted, Fallon's vocals find some fresh diversions, there's a xylophone tinkle in there and the 'gotta catch 'em all' ticklist of pop culture references is unusually low, but there's nothing to incite mass burnings of Sink or Swim and fans demanding their "ABBA" tattoos be removed. That's "ABBA" as in Alex, Brian, Benny and Alex. However, given the band's newfound penchant for 'Breakin' the Law!' it's perversely their least 'ALIVE!' Carpe diem sounding record. Get Hurt starts fittingly though with a mischievous glint in its eye. "Stay Vicious" is a two-fingered salute to expectations. Imagine Alice in Chains hijacking T.Rex's "Buick MacKane" with Fallon spittin' a Staley snarl over that Godzilla-sized riff. Midway though it slips its shackles and calls shotgun for a breezy ride with Iggy Pop's "Passenger" complete with "La La La" refrain. "God I still love rock 'n' roll and I still call somebody baby," Fallon assures us, offering a hearty handshake. It's a little patchwork and goofy f'sure but Rudi them walls are a-rumblin' again. Ditto "1,000 Years" which steps into Angus Young's school shorts for a thunderstruck intro before tossing its cap skyward for a joyous, arms-in-the-air "AY! AY! AY! AY! It's alright" singalong. As entertaining as this all is, you're at the bar nodding appreciatively when you'd rather be down the front, frankly getting messy. It takes the title track to roll out the big guns and deliver the album's first transcendental moment. "Get Hurt" is a deluxe, 'You want the special stuff from behind the counter? ', luxury pop ballad. A subtle, slow burner which simmers broodingly, reeling you in line-by-line 'til its chorus rips out your heart and waggles it in front of your teary face. Fallon plays the broken martyr throughout the album but never more magnificently, "I came here to get hurt / Might as well do your worst to me." It packs some of the pugilist and paramour melodrama of Fleetwood Mac's Rumours but is also, bizarrely, like a Brando-esque male flipside of Miley's "Wrecking Ball". Should he ever snuff out the Gaslight, Fallon clearly has a lucrative sideline penning enormohits for troubled starlets. "Get Hurt" is the album's "Purple Rain" moment. Punks. Goths. Rastas. Dentists. All will be united and collectively shed a tear or three. After this high, Get Hurt dazzles and dips in pretty equal measure. Every time it threatens to reach the heavens it slides, bewilderingly, into a comfy purgatory of fairly workmanlike redemption rockers. None sinful, but when the good stuff is sooo good, darn it gets frustrating. "Stray Paper" is all serious-face guitar chops and conscience wrangling with "Mighty men" offering their "bodies to be burnt" at the feet of Queens. Sharon Jones delivers some guardian angel harmonies, but the song fails to leave footprints in the memory. The perky "Red Violins" starts off promisingly. A marching, celebratory stomp with Fallon the repentant beggar, cap outstretched, but alas it's left wanting with an underfed chorus, "And If you wanna / Then you wanna." "Selected Poems" and "My Dark Places" -- confessional, wistful verses meet blustery, fist-pumping choruses -- feel strangely mechanical. The slim "Ain't That a Shame" (No, not that one) has flashes of heart 'n' spark with a charming melody, but, as worryingly often on Get Hurt, feels like a faint echo of better days. Where Get Hurt is strong, it's bulletproof. "Underneath the Ground" is a lyrical and musical highlight. A locked-down funky trunk with 88 keys, slide guitar and a xylophone (yes!) and Fallon laying low in the endless sleep of the 'Six Feet Under Motel', spinning spooky yarns to his cryptkicker neighbours. A curious and captivating detour with wolves, ghosts, vipers and the "Mad American weather". "Helter Skeleton" is classic, old skool Gaslight though. Pogoing powerpop with a wisecracking Fallon beaming like a Cheshire cat, his head wobbling like a freewheelin' Springsteen '75, "And since you only get high on the weekend / Why don't you feed on me tonight?" No paralysis through analysis here, just pure heart of Saturday night kicks. Recent single "Rollin' and Tumblin'" is another stellar six-shooter firing the spirits of "45" and "'59 Sound" via the Raconteurs' boneshakin' "Salute Your Solution". Heads down. Bullet train. Born to stagedive irresponsibly. "Baby I was born on the 4th of July / Exploding like a firework." It's got gasoline for blood. "Break Your Heart" is another keeper for the long road, a starcrossed, crickets-and-the-moon ballad in the vein of "National Anthem" or "Here's Looking at You Kid". The darkness on the edge of town with only an acoustic for company, Fallon watches the city lights flicker and twinkle down the lost highway. "It would break your heart / If you knew how I loved you / If I showed you my scars." "Break Your Heart" does what it says on the tin. 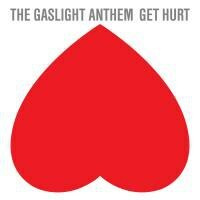 If you loved Gaslight Anthem's previous albums, chances are you'll like Get Hurt. It's a good record, just one unlikely to ignite the true love its predecessors did. There are some real firecrackers here, but there's a surprising smattering of sleepwalkers, too. Here the 'experimentation' translates as a smoothing of the edges, a dimming of the Gaslight. For comparison, rewind to 2012's Handwritten. The opener "45", a valentine to the elixir called rock 'n' roll. Ten seconds in Fallon unleashes one of the most infectiously inspirational, ecstatic caterwauls in recent memory, "WAAAAAH!" Pure, unadulterated abandon. The sound at the top of the rollercoaster. Get Hurt needed more of that "WAAAAAH" spirit. It's smart to move forward just be careful what you leave behind.